Some unexpected time at home, thanks to a visit from the snot fairy, combined with a broken tv aerial means that I’ve had to find other ways to amuse myself other than watching the old gogglebox. Knitting quickly fell by the wayside as my fevered brain deemed it far too uncomfortable to spend more than a few minutes with the entire body of a sweater nestled in my lap. This ruled out crochet too. So I have been alternating between reading and sewing. 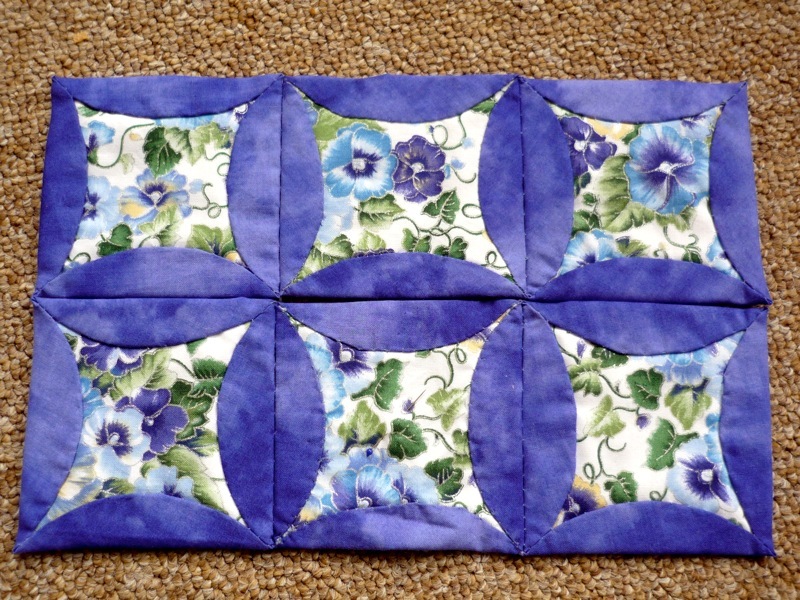 Granted I was ready to abandon this too after vigorous sneezes resulted in one too many jabs of the tiny quilting needle into thimbleless fingertips. I’m rather glad that I persisted because the cushion is coming along nicely. 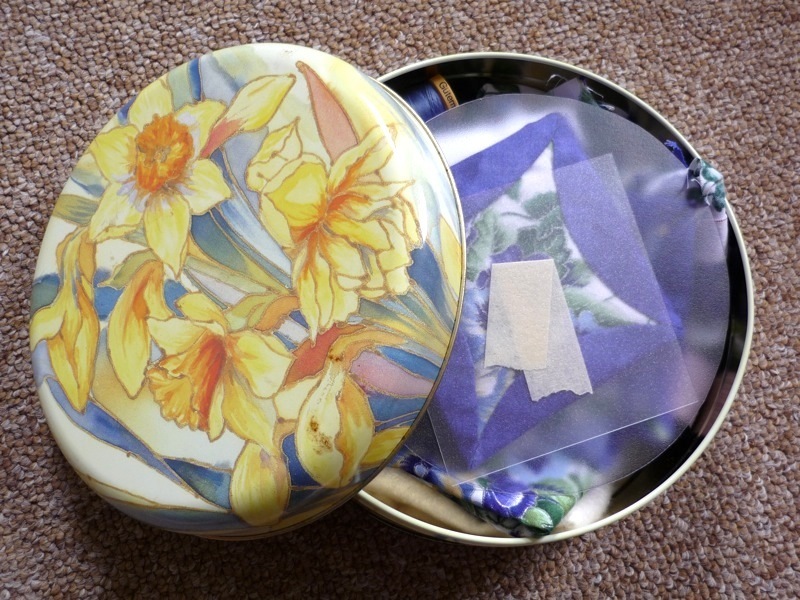 While sorting through some more of mum’s bits and bobs I found this lovely daffodil tin. It’s so bright and cheerful and is the perfect size to hold all of the patchwork materials. It makes me think of spring whenever I look at it. I’ve also started reading a new/old book. I say new/old because I bought a copy of Learning to Swim when it was first published but for some reason I never finished reading it. It gathered dust in my bedside pile and eventually was given away to charity. After reading favourable reviews on a few blogs I decided to give it another try and a fresh copy was promptly delivered by Amazon this morning. So far I am enjoying it. It’s bringing back fond memories of spending hazy, lazy summers with my “best friend in the whole wide world” (whose name, I am ashamed to say, I’ve long since forgotten) and not so fond memories of being the awkward, geeky little girl who was constantly on the receiving end of the class bully’s taunts. Little VintageVickie, with her glasses and her ginger hair, spent a lot of time locked in the cloak cupboard. Isn’t it funny how I can remember the bully’s name perfectly! Thanks for the tip, Vickie. Thanks for visiting my blog. How amazing that you’re only 10 minutes down the road. I almost took a trip to nosey around the antique/french furniture shops this pm but spend the afternoon crafting with Imogen. The cushion is going to be beautiful and what a lovely thing to do. Your Aunt will be touched I’m sure. Now looking for a little inspiration to attend a quilting workshop at Millie Moon..Keep quilting and posting pictures and who know’s I make it after all.. If there’s one thing Warminster does well it’s antique shops and charity shops… a vintage thrifters dream! Thank you for the lovely comment and for stopping by.